The erosion of a limestone plateau has left a beautiful deep gorge, stretching for about 11 miles (18km) of primeval forest, waterfalls, monkeys, and unusual rock formations. The Onbashi Bridge formation is the largest natural bridge in Japan. Sandankyo Gorge is one of only five ravines in Japan that have been designated as National Scenic Beauty Spots and the country takes great pride in the beautiful area, which is a favourite with hikers. It is closed in winter because snow makes the ravine impassable and dangerous but visitors are welcome between the end of April and November. As with most scenic spots in Japan, the ravine is at its most lovely in spring and autumn. One of the most popular walking trails is a round-trip that begins at the Sandankyo front gate with the lovely Kurofuchi pool as the turning point. The hike only takes about an hour each way and is not overly strenuous. The Kurofuchi pool is known for its emerald green water and it is possible to take a short ferry ride across it to a restaurant on the far bank. 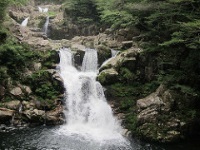 On this route you will also see the Shimai waterfall and Ishidoi rapids.